Cats! I had no idea how creepy they were in the sneak peek photos, and it's pretty hard for a pink cat to be creepy. It's slightly embarassing how often these spiders made me jump. The yellow version with silver spiders, not so much, but these black spiders are just the right size to get me when i'm not wearing my glasses. Fat Quarter Shop was nice enough to send me a layer cake and a charm pack of Bella Solids in charcoal to make another Layers of Charm quilt. Once I had all the blocks sewn up (which was fast) I decided to play around with how I could lay them out to make different shapes. I was surprised with how many layouts I came up with for such a simple block, but that shouldn't be a shock for anyone who has ever played with other simple blocks like the Half Square Triangle. After much deliberation, this layout seemed the best for these fabrics. The black triangles kind of remind me of jack-o'-lantern teeth, and the octagons will be perfect for quilting spiderwebs. This is the next of my quilts to go on the long arm after I finish up some more customer quilts, but the longer I wait, the more I think about adding borders. Maybe just some more Bella black? I can't decide, and the cat's no help. Thanks again to the folks at Fat Quarter Shop. Head over to their site for the Layers of Charm pattern, and have fun playing around with their setting! Linking up with Crazy Mom Quilts for Finish it up Friday! This summer, Hawthorne Threads started putting out their own fabric lines. They all looked really cool, but with so many fabric lines coming out these days it got lost in the shuffle. But luckily, I subscribe to their newsletter and they featured a great mosaic of their Bengal line that I just couldn't get out of my head. Hawthorne was kind enough to send me a bunch of fat quarters from the line, and an amazing backing fabric. Because they're digitally printed, it all came on one giant cut of fabric. At first I was pretty surprised at how strange the fabric was. It's pretty stiff, probably from the printing process, and it's a tight weave, similar to Art Gallery, so while it cuts amazingly, you really need a sharp needle to sew it. My Juki was able to sew it without a problem, but it was loud, like it had to punch through the fabric. The other strange thing, was when I quilted the fabric, every last needle hole was very pronounced. You could see through them, when you held it up to the light. Once you washed it, everything was fine. The fabric softened up really nicely and all the holes closed up. Now, you can't tell it apart from a quilt made from any other fabric, and I wouldn't worry about mixing these fabrics with others in a quilt. I will say, that I had some bleeding. Hawthorne suggests you wash your fabrics first, probably because it's so stiff from the printing, and it has some excess dye. I'm a sew first, wash later girl, so I ignored this tip and threw it into the wash with two color catchers. Neither color catcher got any dye, and the front was perfectly fine, but the back bled in a few spots. I'm hoping that the more we wash, the lighter they'll get. Anyway, back to the quilt. The mosaic from the newsletter was just squares of the one print from the Bengal line. So I got every color of that print, cut it into squares, and sewed them together. Because they were printed on a very wide fabric, I had a bunch of fabric leftover with a couple inches of the print, the selvage, and then the extra white fabric beyond that. I cut that to the width of my squares, and added it around the edges to bring it out to the size of the backing. So all along the edges, you get little peaks of the selvages and Hawthorne's tag line "from two love birds who love fabric." I love the backing! Most of their lines feature a backing like this and I was so excited that they offered to send me one for this quilt. While I was sewing, I had the backing up on my wall and I kept humming "Eye of the Tiger." It was very motivating. I just love all the little details that they put into the backings. It's huge, but you can spend a lot of time picking out different shapes and doodles. Thanks Hawthorne Threads for sending me this fun fabric to work with! Linking up with Amanda Jean for FInish it up Friday! This is one of those crazy ideas that wormed its way into my head after scrolling through Instagram and wouldn't be quiet until it was finished. The original idea was from @_glass_half_full, but I first saw Kitty Wilkin's first few blocks, and had to make my own. These are seriously easy blocks to make. I started with six inch blocks, sliced randomly across at any angle, then added a strip of fabric from my scrap bins. I always love a project that gives me a chance to use up some scraps. And I was able to make some almost fussy cut, like these animals from one of the Cotton and Steel lines. After the first handful of blocks, I settled on a light gray background, which was not an easy choice since I don't have a huge pile of light gray fabrics in my stash. Actually, the prints I used here are pretty much it, but there was enough variation to keep the scrappy vibe. After a few more blocks, the rainbow started to become the obvious arrangement. I seriously can't help but arrange things in rainbow order. My original plan was to cut the squares back into 6 inch squares to make everything fit together nicely, but I once I had the rows laid out, I liked how they were staggered. It was kind of magic how most of the rows were already pretty close to the same length. So I sewed them into vertical strips then lined the pink row up as I sewed them all together. I only had to add fabric to one strip, and then trim off the excess in a few other rows. When it came to quilting, I had a plan about doing a lot of vertical and horizontal lines, then adding some hand stitching in a rainbow of perle cottons. That was the plan right up to the point that I loaded it onto my long arm and was about to go. There was just something about those horizontal rows of quilting space that I just couldn't resist. So I went for it. For a quilt that started on a whim, it turned out really great. It's a little smaller than most of my quilts, but it's just big enough to lie under on the couch as long as you're alone or with a cat. And it'll be getting a hanging sleeve for now and heading to my guild's show at the Quilters Gathering in November. Linking up with Amanda Jean for Finish it up Friday. And crossing this one off my list for Q3 of Adrienne's 2015 Finish-Along. Friday Finish: I Spun Some Wool! There's this feeling when you first make a thing. When you work and work, and learn a new skill, and in the end there's a product that you've made that looks and feels just like the thing you can buy in the store. I had that feeling after I made my first quilt. I wrapped myself in the soft warmness and felt like the champion of the world. Many quilts later, that feeling is still there, but less so. I got that same feeling when I finished spinning my first batch of roving into yarn. It was real yarn! You could pull on it and it didn't break! It was largely consistent in thickness, and overall, not too thick! I made everyone look at it and touch it. So now my goal is to spin more and more wool. The woman who taught me showed me all her spinning tricks, like drafting wool with the spindle still spinning (I'm still rocking the park and draft) and she even did some craziness where she draped the spindle over her outstretched hand so she could spin over a yard of yarn in one go. I was mesmerized and I want to master all those tricks. This is next up. It's wool that a friend was gifted, so we don't know what it is, but it's smoother than the brown wool, which will make it a little more difficult to spin. And once it's spun, I plan to ply it with the brown. I'm hoping the contrast will make it easier to see where I need improvement. Sometimes I see something on Instagram that I just want to make. I don't like waiting for patterns, tutorials, or whatever. And to be honest, if I bought every pattern and book for everything I wanted to make, I'd never have money for the fabric to make anything. So when Aneela Hoey came out with her Double Pocket Pouch pattern, I thought to myself, "I know all about zippers and pouches, I don't need to buy the pattern." I was super wrong. I had to redo so many things while making this, I'll just buy the pattern the next time I want to make one. I made the outside first. The geese were just some practice blocks that I had made before, so I found some matching scraps and made the back panel. I have a wallet with a back zipper, so I added one here, because more zippers is always the answer. Then I made the inside, and everything went sideways. I measured my front, tried to account for seams, zippers, and whatnot, and made the vinyl panel. Even after measuring and mathing, it was still too big. So I had to trim top and bottom, then cut a bit out of the middle and sewed a strip of fabric over the edges. In the end it worked, but the constant fixing is not fun when you're dealing with vinyl. And you may notice that my zipper is still super long. The original has a tab that hangs on the outside, but I'm not in love with that look. So I left it long, tucked it in, and decided to give it a test run. By now I know that it works like that, and could cut it and finish the end, but I've just not gotten around to it. In the end, it worked out. All the zippers work and it fits my pile of felt tip pens and washi perfectly, so I call it a success, but I wouldn't make another without the pattern. For the last couple months (really almost a year), I've been participating in a great round robin. Our group is so talented, and the quilts are all wildly different. Each month it's exciting to see what you'll receive and a little nerve-wracking. Many of the tops are out of my comfort zone in color or style, and the more people add, the better they get. Luckily, when I got Christina's quilt (of Wips and Tuts) I knew exactly what I wanted to do. She had an autumn theme, which made me scratch my head while I was looking at the progress shots on Instagram, but when I opened it up, I knew it needed foxes. I used Elizabeth Hartman's Fancy Fox pattern, and pulled a bunch of autumn colors. I loved the light blue background that both Jenn and Leanne had used, so I continued that color theme. I packed it up and sent it on to Chelsea for it's last addition. Her plan had also been foxes (great minds!) so I'm curious to see what she adds now that I've beaten her to the punch. Here's a pic that Leanne posted of my quilt. I'm so in love with what everyone has done with it and can't wait to get it back in September! When you participate in swaps, you always want to add some goodies. I had bought the Sew Together bag pattern with the intention of adding that to this year's swap packages, but after making one I decided that it was just too much work when you have multiple swaps happening. So when the Curvy Clutch pattern came out (and it's free!) I downloaded it hoping to have found a perfect swap extra. The first one I made was the Lizzy House one. It went so fast and was really well written, so every step was pretty easy. I only had to check myself once when attaching the zipper, but that's just a good idea whenever zippers are involved. I didn't add piping or anything to mine, mostly because I didn't have piping in the right colors, but also the fabrics are enough on their own. I think i'm going to buy a pile of piping and rick rack to try with this pattern, and maybe leather for the top accent panel. There's so many on Instagram under the hashtag #curvyclutch that you can scroll forever and get all the inspiration you want. These are just the right size for pens and washi tape, or you could fill them with some sewing supplies for sewing on the go. I think big scissors will just fit in these, but it might be a squeeze. I enlarged the pattern and plan on making a larger purse-sized one with a strap. And I'm going to try fusible fleece as my interfacing on the next one. I think it'll have a nicer stand, especially if the pattern is enlarged. After such a rough start to my Cotton and Steel Mini Swap, I really was against joining another swap. I was really worried about getting another quiet partner, and I was thinking of thinning out my to do list, but then my friend Sarah signed on to be one of the swap leaders for the Lizzy House Mini Swap, so I knew I would be in good hands. My partner was awesome. We had very similar style and she was up for anything. And the best part, was that her IG was full of photos! Win! So my first step was to gather all my Lizzy. I'm a fabric hoarder, but didn't think I owned much. Ha! I just kept finding more and more in my stash (even after I had finished my mini). My partner really liked Catnap, which I was a little light on, but a friend generously let me cut some of hers up. I brought my pile of Lizzy to my guild's retreat in April without a plan, but once I started looking at the fabrics I had, I knew that the best direction was something that would let me fussy cut. I separated my fabrics into a pile of fussy-cut-friendly fabrics and a pile of blenders and noticed that there was a complimentary blender for each fussy, which is perfect for Elizabeth Hartman's Sparkle Punch pattern. I cut up all my white-ish pearl bracelet fabric (which was just enough!) and got to making stars. Then I ditch quilted along each seam to hold everything in place while I did some big stitch quilting in perle cotton. I think the quilting was my favorite part of this quilt, and I'm already planning on doing more, which means I'll need a bigger stash of perle cottons. I'm so pleased with how this one came out, and my partner loved it too, so that's a big win. I need to buy another yard of the white pearls to make another for myself. Linking up with Amanda Jean for Finish it up Friday. And this is one off my list for the 2015 Finish-Along! It feels like ages ago that I signed up for the Cotton and Still mini swap on Instagram. I was high off my Schnitzel and Boo swap and it's just so easy to fill out a form and put a ship date on a calendar that seems forever away. This swap turned out to be a bit of a tough one for me. My partner was very quiet, like weeks between IG photos, and none about the swap. She had life happen to her, and we all can understand, but it was still frustrating trying to figure out what she would like from non-quilty photos. In the end, I ended up pulling fabrics from her favorite C&S designer, Melody Miller, and settled on a Carolyn Friedlander Aerial Grove-esque design. The whole thing was done by hand. Once each "squircle" was hand appliqued I wanted to finish the mini with hand quilting as well. I thread basted the whole thing and grabbed some perle cotton in some C&S colors. Because the appliques were very vertical, I wanted my quilting to add a horizontal line. All in all, it isn't perfect, but I love it so hopefully my partner will love it too. It wasn't the most fun I've had in a swap (sorry to all my friends that I feel I complained to constantly) but I got a great mini out of it from someone local I plan on getting to know in the real world, so I think it worked out. Linking up with Amanda Jean for Finish it up Friday and this is one off my Finish-Along list. A few months back Pat Bravo sent out a call on Instagram asking if anyone was interested in getting a bundle of her scraps to make a quilt for Project Linus. I jumped on it! I love sewing with scraps and Pat's piles looked so pretty! When I got my bundle, I loved the soft girly feel, but those two dark red bits really threw me. There was plenty of fabric to work with, but I really wanted to incorporate all the fabrics, so I needed a design that would spread out those reds. So I went with the Scrappy Striped Flying Geese tutorial that Heather at House of a la Mode put out. I changed them a little. Instead of sewing strips of scraps to foundation paper, I just made slabs with my fabric and cut them to size. I love how it changed the placement of the fabrics in the geese. For quilting, I knew I wanted to do straight lines in each of the geese, but since it's going to a child, I didn't want to quilt the whole thing to death. Loose loopy quilting gave it just enough texture and strength for multiple trips through the washing machine, but it'll still be drapy enough for cuddling. For the backing, I had this pink print flannel in my stash. It was just enough to cover the back of this quilt and matched perfectly with the pinks on the front. A while back, Sew Mama Sew put out a call to see if anyone wanted to participate in a little kitchen sewing challenge. We'd get to pick our own fabrics from Spoonflower and sew whatever we liked. I jumped in because it was perfect timing. My daughter is going to need to bring lunch to school in the fall (thinking ahead!) and since I let my son pick out his snack bag fabric, it seemed like a great chance to let her pick out hers. I popped her on the computer, narrowed her search to "kawaii" and "food" (because you could be scrolling through fabric designs for days!) 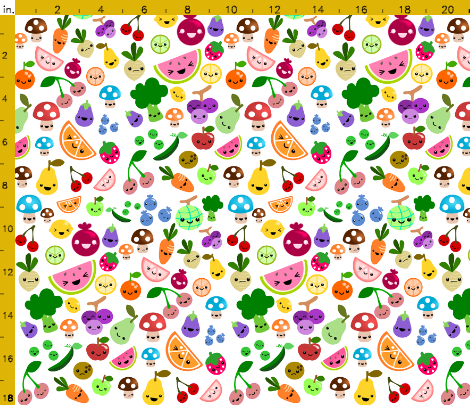 and she picked the Cluttered Fruits fabric from BerrySprite. And I picked out the Gizmos Galore fabric from KatherineLenius. I chose to have them printed in Kona cotton (instead of canvas, or linen, or one of their other many substrates) so that I could use it in a bunch of different ways. I was a little bummed at how the fabrics faded when I washed them, and I've heard that they'll fade faster than a traditionally made fabric, but I'm fairly certain that they'll be lost at school or too gross or worn out before that happens. And I really love the variety of prints to choose from, so it's just something to consider. In addition to the sandwich wrappers, I made her a couple snack bags to go into her lunch box. I love making these (here's a link to the last batch I made), and a link to the tutorial that I use here. I also decided to make some that are super sized for when we go out as a family and I want to bring a larger portion of snacks for us all to share. They're about 8" x 10", and I used the same tutorial, I just cut my original rectangles to be 8.5" x 10.5". The lining does tend to stretch more when you sew a longer seam, but it doesn't really effect the end result. Now on to the tutorial! Cut your fabric and vinyl into 12 inch squares. You'll be able to make at least two with a half yard of fabric. Carefully peel the vinyl from the backing paper. Don't discard it! Place your fabric wrong side up on your ironing board. Place the sticky side of the vinyl to the wrong side of your fabric. Don't worry if it's not perfect the first time, you can pull it up and try again. And we'll be finishing the edges, so the vinyl doesn't have to line up perfectly with the edges. Place the backing paper you saved onto the vinyl and press with an iron according to the manufacturer's directions. To avoid bubbles, start from the center and press out towards the edges. You could fold the edges over to finish them: fold one side over a 1/4 inch, then fold over again, sew down. Then repeat for the other sides, taking care to keep the raw edges folded under at the corners. I chose to finish my edges with bias tape. Open your tape up and sew the right side of the tape to the vinyl side of your wrapper with roughly a 1/8 inch seam. You'll want to miter the corners and finish the ends similar to how you sew a binding on a quilt (here's a great tutorial from Crazy Mom Quilts, just do it in small scale). Once you've gone all the way around, fold your bias tape to the front and topstitch about an 1/8th of an inch from the edge of the tape. Next, take your velcro, and line up the soft part with a corner on the vinyl side. Use the 45 degree mark on your ruler to make sure that it's lined up with center line of the wrapper. Pin in place and sew down. Align the scratchy side of the velcro with the opposite corner on the right side of the fabric. Make sure that it sits about 2 inches in from the corner and is lined up with the edge of the ruler when the 45 degree line is on the edge of your wrapper. Pin and sew down. And you're done! One of the great things about these wrappers, is once you open it up, you can use it as a placemat for the rest of your lunch. It's perfect for taking on a picnic when you aren't sure what's been crawling on those picnic tables or if you're just eating on the ground. To clean, just wipe down the vinyl side with a damp cloth. Be sure to check out the other challengers to see their cool projects. 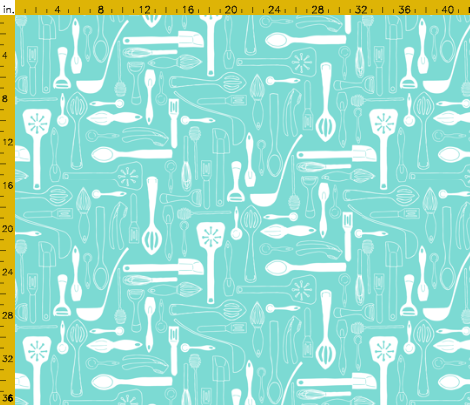 And head over to Spoonflower for all their awesome prints. Thanks Sew Mama Sew for the fun challenge! This is probably the tiniest and quickest finish I've ever posted. My guild (go Seacoast MQG!) is putting on an exhibit at a quilt show later this year. We're showing what we think Modern Quilting is in a show that is very traditional, so as a side challenge, we were given traditional blocks to modernize, interpret, and make into a mini. This is not that mini. The blocks finish to three inches, so those curves are tiny! I'm pretty glad that I got a chance to practice my curved piecing before really getting into it. I'm not the most proficient curve sewer, so I needed the extra credit work. I made up four blocks and declared that my template was a winner. Not all those curves are perfect, but it did what I wanted it to do. And I'm really okay with ripping out stitches and resewing in the final product, but there's no reason to rip out on a practice piece. And when I get into my mini for the show, I really need to work on sewing the blocks together, but the seam between the bottom aqua curve and the yellow is spot on! I might have to draw up a diagram to keep track of which way to press my seams. I was pressing them all the same way, but these nested really well, and I think that was what made it so successful. The next step is obviously to quilt it to death. I just did some echoing curves. I'd like to say it was a very deliberate and artistic choice, but it just seemed like the easiest design with the same foot I had on the machine already, because who wants to pull out the free motion foot for a tiny block of sewing. Once it was quilted, I just went into autopilot mode, and put on a binding. I did get a little creative with it and pulled up this tutorial from Sew Fresh Quilts for a flanged binding that I've had bookmarked for a while. This seemed like the perfect chance to try it out, because if it was tedious, I only have 36 inches of binding to sew. And now it's a mini mini? It's about six inches square, which makes it perfect for a mug rug, but all that white is going to be stained the second I walk near it with my coffee cup. So I'm just going to hang it on my wall for now. But now I have a cute thing and I know my template works, so I can get started on the real check-list item! So everyone and their BFF has already written a post about QuiltCon. It was amazing, we learned a lot, met people in person and wondered internally how we could imagine their voice so differently from the real thing (yep, me too Sarah.) So this isn't that post, but it's related, like a second cousin once removed. I took a lot of classes (three full-day classes!) and I loved them all, but I think I got the most bang for my buck out of my longarm quilting class with Krista Withers. Not only was she a great teacher, and super inspiring, but the class reminded me how quilting on a long arm is supposed to feel. My machine is ten years old, has been moved twice (at least) and was set up by me, my husband, and two friends. I assumed that the difficulty I was having getting good tension and smooth lines was all just irreversible wear and newbie error. But using the brand new, never-been-touched Handiquilters at Con made me realize that my machine could be better. So first thing I did when I got home was order new short runners. The reason I couldn't get smooth lines was that my machine was hopping over some serious dents. (Why is it so obvious now?) And once I fixed that problem, I decided to bring my bobbin case into a dealer, to let them either teach me to get good tension or to show me where it was broken and sell me a new one. The woman took one look, said it was SUPER busted and sold me a new one with a "Wow, I can't believe how busted that was" discount. Win! After that, less than $100 in parts and shipping, the machine purrs. It's not quite what the brand new longarms at QuiltCon felt like, but it's as close as I think I'll ever get. So I loaded up a quilt and gave it the Krista Withers treatment. The quilting is a little easier to see from the back. It's hard to see on this quilt, but the quilting is rows of paisleys, with pebbles thrown in to fill the gaps, and straight lines in between and on the edges. All that quilting is kind of lost on all this pattern, but that made it a really easy piece to practice on, and the texture is amazing. For this one, I pulled out all my sales flyers from the newspaper recycling bin and cut them into 11" squares. Then I glued a whitish strip diagonally down the center and built out from that. I didn't trim any of the strips to make them straight, and I hardly pressed them before sewing unless it was really necessary. I just trusted in my eye to keep things straight when I sewed and trimmed the blocks really carefully at the end. After a lot of paper ripping, and one crazy pieced back (thanks Jess!) I quilted this with such ease. I'm really glad that QuiltCon happened when it did because I was starting to lose hope, but this quilt really brought back my love of longarming. Lessons learned: sometimes the errors ARE the machine and not you! It's not (always) your fault. Linking up with Kelly for Needle and Thread Thursday and Amanda Jean for Finish It Up Friday! One of my favorite things about this community of sewers is our ability and willingness to help. It's hard to hear about something and not want to do something, and I'm always glad when someone has an idea to put all of us to work. So when Rachel, of Stitched in Color, announced that her birth hadn't gone to plan and that little Eleni had suffered complications all her readers felt that heartbreak too. And then Jodi, from Tales of Cloth, gave us something to do. She put out a tutorial for hexie flowers and asked that people send her flowers with a dark center. (Go check out here to get the full tutorial.) These little flowers don't take very much time at all to make, but each stitch feels special. It's just a little way to show Rachel, her family, and Eleni that we're thinking of them all. There's still a little time if you'd like to contribute flowers. Pop over to Jodi's site to read her full instructions and get her address to mail them. and an icy blue Bella Solids charm pack, then commenced some very secret sewing. (aw!) and you use one layer cake and one charm pack to make it. There's no cutting fabric, just sew charm to layer and trim. It went really fast and then I got to do the fun quilting part. One of the great things about this quilt is that it's such a big blank palette for quilting! I loaded it up in the long arm thinking I would do some graffiti quilting, then had second guessing time where I pondered all the other ways I could quilt, then eventually went back to the graffiti. It's so much fun, and kind of like a crossword puzzle for quilters because of the thinking that goes into it. I love doing it. I've been cuddling under this quilt for a while. It's so fun to look at, because the quilting looks so different in all the big squares, some really highlight the quilting, and some squares let the fabric take focus. Every time I use it, I find something new to love. For the back, I pulled out my stash of Ikea Britten Nummer. I found it in a store last summer and rationalized buying ten yards. This was the first time I convinced myself to pull it out. It's a pretty thin fabric, but very silky, so the quilt is more for summer night cuddling rather than winter polar vortex cuddling, but I do it anyway. And the binding is super scrappy, cut from a handful of Cotton and steel fat quarters I had in my stash. So many seams, but it's so fun. Puppy is also a fan. to get the pattern! And hop around to see all the pretty quilts! pinned since she made it. I loved the colors. I loved that it was based on something from Ikea. I have a thing for triangles. Basically, I've just been waiting for the chance to make one of my own. So when it was my turn to pick a block for my do. Good stitches group, I thought this would be perfect. 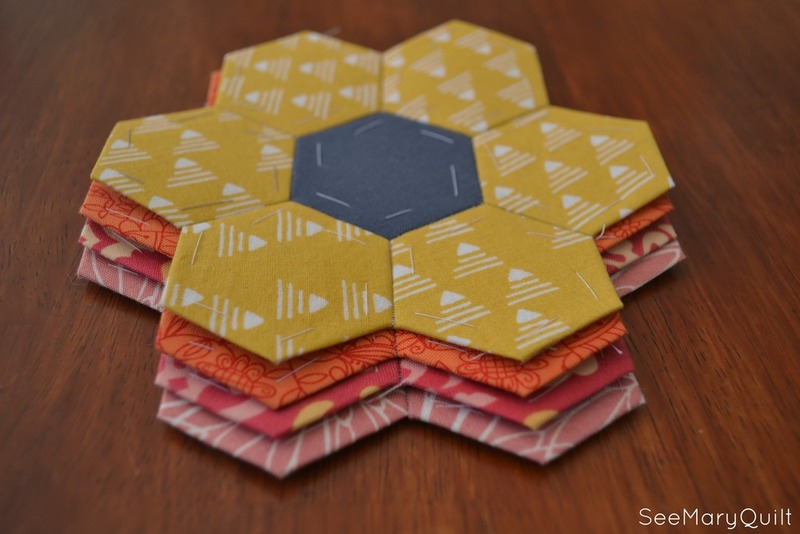 I asked each member to make a block of nine HSTs in warm and cool colors. I requested solids, but any saturated, tone on tone print that read as a solid would do. While they were doing that, I made a pile of single HSTs that I used to blend the two groups together. Once I had the top pieced, I sent a picture to the group's Flickr page. We're putting on a special exhibit at QuiltCon, and I just knew this quilt would have a good chance of being selected. Luckily, it was! So I had to get it quilted and finished so I could send it in time for the show. I love that the straight lines don't take away from all those triagles, but because the squiggles are of random length, it's fun to look at. I can't wait to see it hanging in Austin. Friday Finish: Instagram Mini Swap! That was until I saw all the awesome things that were being made during the second round of the Schnitzel and Boo swap. Seriously, every single mini was awesome and I wanted them all. But it was too late for that swap, and while I was being sad, the IG Mini Swap started up. I signed up immediately! After a stressful wait, I finally got my partner's info. I was a little bummed, because she wasn't one of those super active Instagrammers. I worried that I wouldn't have enough to go on, but I started pulling together some ideas. My partner liked aqua and gold, triangles, asymmetry, and her website looked very clean and modern. So I pulled all of my gold and aqua fabrics, added some gray for good measure. I went with a cream for a background color, because the white just looked to harsh. I sketched out a doodle of this, then cut triangles out of paper that were the size that I wanted. I laid that triangle on the fabric and cut 1/4 inch past the paper triangle, stitched them together in rows and was shocked that it seemed to work. There are a few spots where I lost triangle sides, but I'm quite pleased with how it turned out. I bought some heavier gold and aqua thread with the plan that I would background quilt in white and then do some hand stitching in color, but once I had the mini basted, I just didn't like that idea anymore. Instead, I went with wavy lines over the whole thing, mostly with the white, but with stripes of the gold and aqua threads here and there. When I was done, I realized it was wind blowing over mountains! Aw! Now this mini has a home on the wall in my partner's sewing space. It perfectly matches her wall, and it looks very happy there. I have totally fallen in love with needle turn applique. I've always loved a good hand stitching project, and these projects have turned out a lot easier to do than I thought and I can stitch shapes that I like without having to deal with machine sewing curves. Our guild (Seacoast Modern!!) had a mini swap with another guild. The theme was a "Sense of Place" which completely threw me for a long time. I seriously would try to figure out what I would make, brain would turn to mush, and I'd avoid thinking about it with a different project.
. I was completely hooked by this book; great projects, a good read, and pretty colors. So I tried to see if one of the minis in the book would apply to the swap challenge. One of the best thing about the seacoast is the beach, and one of my kids' favorite things to do is find pretty shells, rocks, or sea glass, and Aerial Grove kind of reminded me of pebbles lined up on the beach. So I pulled a rainbow of scraps and started stitching them down to my "sand" fabric. I had thought to put them upright as a center column with blue ocean to the right and green grass to the left, but it just looked to busy, so blue ocean won. I used lighter colors close to the sand to get a waves crashing effect. Then I quilted it all over with a wave pattern. And of course, you need a label. Once I finished that mini, I started right up on one that I would get to keep. I think in the new year, I'm going to start work on a whole quilt of needle turn, as my big 2015 project. Friday Finish: Chicopee Plus Quilt! Here's an old finish for Finish It Up Friday. I'd finished this quilt a while ago, but didn't want to over share it in case the new owners decided to check my blog. You never know, and never want to ruin a surprise. Anyway, I downloaded the pictures to the computer and completely forgot about them until a few days ago when I decided to tidy up my folders. Yay! This was a kind of joint collaboration between my mother and I, one of my cousins got married recently and she decided that a quilt would be the perfect present. Luckily, I was already thinking about a quilt, so she helped me with some of the supplies and then let me have free rein. I went with Denyse Schmidt's Chicopee line because it just works together, but seems to have a little of all the colors. I wasn't sure what my cousin would like, so I wanted to give them all of them, in a way that wouldn't blow their eyes out. And Chicopee does this really weird thing where it's loud and subtle, masculine and feminine, large prints and small prints, retro and modern. I don't know how it's possible, probably magic. I modified a pattern for neutral pluses on print backgounds, though for the life of me I can't remember which pattern I used. And I'm really glad that I gave all those prints some room to breath. Bonus, it gave me a lot of negative space to quilt! I rotated between a handful of quilting patterns in the pluses, all in, more or less, coordinating thread. This star pattern ended up being one of my favorites, that will get put into the usual rotation. It's super fun, and doesn't have to be exact to look nice. for Finish It Up Friday! Oh hi there! Remember me? I used to write a blog? Yeah, instead, I've just been sitting at home sewing and knitting without you. , all fuzzy, warm, and unblogged! Perfect! I tossed it on the girl, grabbed my camera, and made grand promises about leaving a bag of Halloween candy unprotected on the table (models always demand candy in their green rooms). in Cosmic Wanderlust. I bought it as my souvenir from Purl Soho on a trip this summer, and there's still one more ball to make into a hat. Or I might have to just make a second Honey Cowl for the little girl. She loved wearing it and it's so cute on her! And seriously, I'm completely unable to say no to this face.